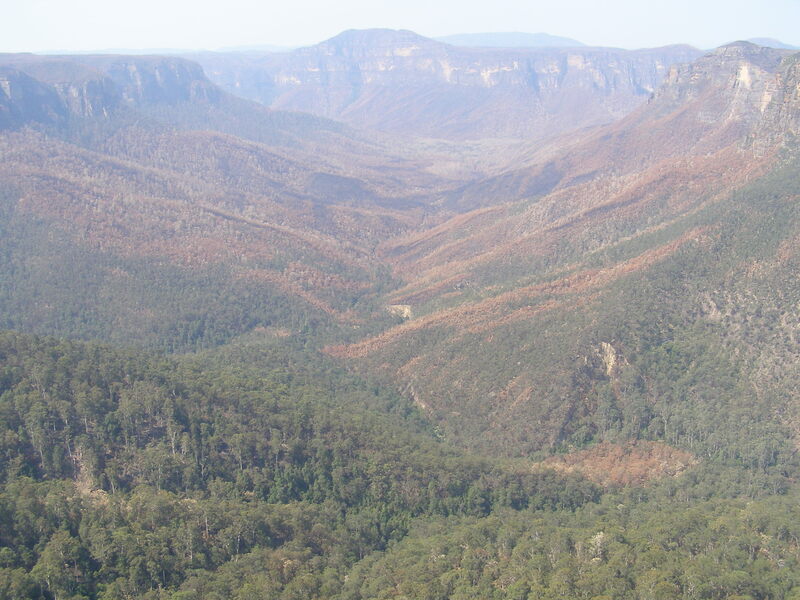 some of which have graced the Grose Valley in the Blue Mountains for hundreds of years. The following articles are drawn from those by Gregg Borschmann, the first of which hit the front page of the Sydney Morning Herald on Monday 11th December 2006, following the massive bushfire conflagration that coalesced in the Grose Valley on 23rd November 2006. From the community’s perspective, no noticeable lessons have been since learned by the Rural Fire Service (RFS) responsible. The prevailing bushfire management culture is that unless private property is directly, bushland is not valued and so not defended from bushfire. Indeed the approach is to let a bushfire burn as a defacto hazard reduction, so long as it doesn’t threaten human life or property. 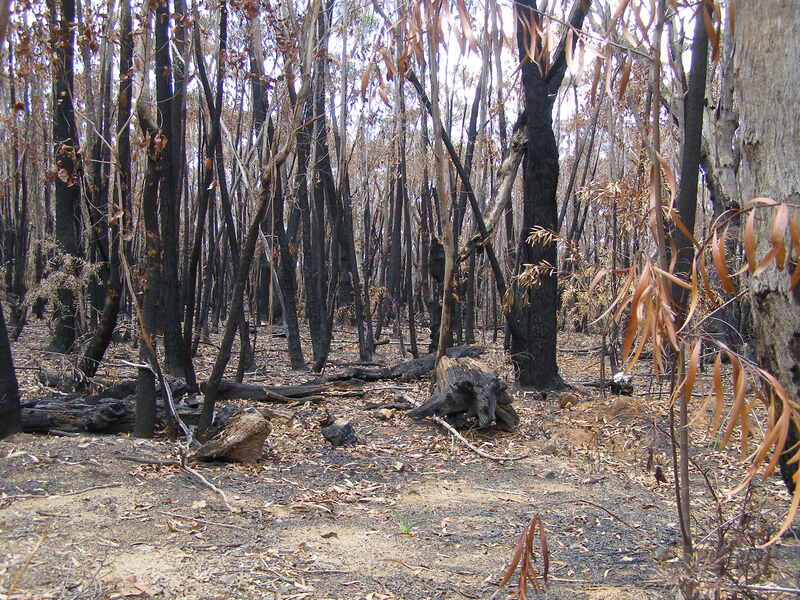 The RFS does not consider bushland an asset worth protecting from bushfire no matter what its conservation value, so with such a mindset such an ecological tragedy could well happen again. ‘More than seventy years ago this forest inspired the birth of the modern Australian conservation movement. Today Blue Gum Forest stands forlorn in a bed of ash. But was it unnecessarily sacrificed because of aggressive control burning by firefighters focused on protecting people and property? That is the tough question being asked by scientists, fire experts and heritage managers as a result of the blaze in the Grose Valley of the upper Blue Mountains last month. Scientists, heritage managers and the public were angry that the region’s national and international heritage values were being compromised or ignored. There was anecdotal evidence that rare and even common species were being affected by the increased frequency and intensity of fires in the region. Annoyance was voiced over the environmental damage for hastily, poorly constructed fire trails and containment lines, and there were concerns about the bill for reconstruction of infrastructure, including walking tracks. The fire manager and ecologist Nic Gellie, who was the fire management officer in the Blue Mountains for the NSW National Parks and Wildlife Service during the 1980s and ’90s, says the two original fires could have been put out with more rapid direct attack. “Instead, backburning linked up the two fires and hugely enlarged the fire area … what we saw would be more accurately described as headfire burning, creating hot new fire fronts. While it protected the town of Blackheath, the plateau tops burnt intensely – and that created new problems both for management of the fire and the protection of biodiversity. In that dramatic week, Mr Gellie confronted Mr Koperberg with his concerns that the commissioner was interfering with the management of the fire by pushing hard for large backburns along the northern side of towns in the Blue Mountains from Mount Victoria to Faulconbridge, along what is known in firefighting circles as the “black line”. The Herald has since confirmed from numerous senior sources that “overt and covert pressure” from head office was applied to the local incident management team responsible for fighting the fire. There were also tensions relating to Mr Koperberg’s enthusiasm for continuation of the backburning strategy along the black line – even when milder weather, lower fuel levels and close-in containment were holding the fire. Several sources say the most frightening threat to life and property came as the fire leapt onto the Lawson Ridge on “blow-up Wednesday” (November 22) – and that those spot fires almost certainly came from the collapse of the convection column associated with the intensification of the fire by the extensive backburns. Blackheath escarpment broadscale backburn – “incidental in the scheme of things“? Mr Koperberg, who is retiring to stand as a Labor candidate in next year’s state elections, rejected the criticisms of how the fire was fought. He told the Herald: “The whole of the Grose Valley would have been burnt if we had not intervened in the way we did and property would have been threatened or lost. We are looking at a successful rather than an unsuccessful outcome. Mr Koperberg said it was “indisputable and irrefutable” that the Blue Mountains fire – similar to fires burning now in Victoria – was “unlike any that has been seen since European settlement”, because drought and the weather produced erratic and unpredictable fire behaviour. The district manager of the Blue Mountains for the Rural Fire Service, Superintendent Mal Cronstedt, was the incident controller for the fire. Asked if he would do anything differently, Mr Cronstedt answered: “Probably.” But other strategies might have also had unknown or unpredictable consequences, he said. John Merson, the executive director of the Blue Mountains World Heritage Institute, said fire management was being complicated by conditions possibly associated with climate change. “With increased fire frequency and intensity, we are looking at a fundamental change in Australian ecosystems,” he said. “We will lose species. But we don’t know what will prosper and what will replace those disappearing species. It’s not a happy state. It’s a very tough call for firefighters trying to do what they think is the right thing when the game is no longer the same. ‘A bushfire scars a precious forest – and sparks debate on how we fight fire in the era of climate change. “Snow and sleet are falling on two bushfires burning in the Blue Mountains west of Sydney.” ~ ABC Radio, November 15 (2006). The news report was almost flippant, something that could happen only in Dorothea Mackellar’s land of drought and flooding rains. Later that evening, two weeks from summer, Sydney had its coldest night in more than a century. Over the past month – as an early summer collided with a late winter and a decade-long drought – NSW and Victoria have battled more than 100 bushfires. But of them all, last month’s Blue Mountains blaze reveals tensions and systemic problems that point to a looming crisis as bushfire fighters struggle to protect people, property, biodiversity and heritage values in a world beset by climate change. The tensions have always been there – different cultures, different ways of imagining and managing the landscape. Perhaps they are illustrated by a joke told by two Rural Fire Service crew in the Blue Mountains. “How does the RFS put out a fire in your kitchen? By backburning your sitting room and library.” The joke barely disguises the clash between the imperative of saving lives and homes, and the desire to look after the land, and the biodiversity that underpins our social and economic lives. For bushfire management the debate tentatively started a couple of decades ago. The challenge was to do what poets, writers and painters have long grappled with – coming to terms with a country whose distinctiveness and recent evolutionary history have been forged in fire. Drought and climate change now promise to catapult that debate to centre stage. 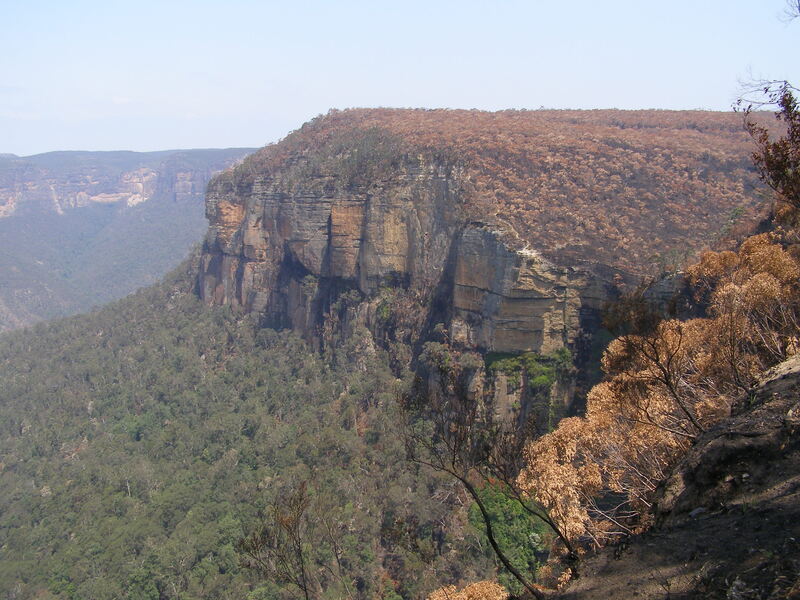 It is perhaps no accident that such a defining fire has occurred in one of the great amphitheatres of the Australian story, the Grose Valley in the upper Blue Mountains. Charles Darwin passed by on horseback in 1836, and described the valley as “stupendous … magnificent”. The Grose has long been a microcosm of how Australians see their country. In 1859 some of the first photos in Australia were taken in the valley. Proposals for rail lines and dams were forgotten or shelved. The first great forest conservation battle was fought and won there in 1931-32. But now the valley is under threat from an old friend and foe – fire. Ian Brown has worked on dozens of fires in the Blue Mountains. He is a former operations manager for the National Parks and Wildlife Service. For Brown, even more worrying is the trend. Ross Bradstock, a fire ecologist, agrees. Professor Bradstock is the director of the new Centre for the Environmental Risk Management of Bushfires at the University of Wollongong, which is funded by the Department of Environment and Conservation and the Rural Fire Service. He says Australia stands out as one of the countries whose vegetation may be most affected by climate change. Wyn Jones, an ecologist who worked for the wildlife service, says the extremely rare drumstick plant, Isopogon fletcheri, is a good example. There are thought to be no more than 200 specimens, restricted to the upper Grose. Last week, on a walk down into the Blue Gum Forest, Jones found three – all killed by the fire. The great irony of the fire is that it was better weather, low fuels and close-in containment firefighting that eventually stopped the fire – not big backburns. Remote area firefighting techniques have been pioneered and perfected over recent decades by the wildlife service. In 2003 a federal select committee on bushfires supported the approach. It recommended fire authorities and public land managers implement principles of fire prevention and “rapid and effective initial attack”. Nic Gellie, a fire ecologist and former fire manager, has helped the wildlife service pioneer ecological fire management. The models are there – but he says they have not been used often enough or properly. Doubts have been expressed about the sustainability of the current remote area firefighting model. It is underfunded, and relies on a mix of paid parks service staff and fire service volunteers. Most agree the model is a good one, but not viable during a longer bushfire relying on volunteers. The Sydney Catchment Authority pays $1 million for Catchment Remote Area Firefighting Teams in the Warragamba water supply area. It has always seemed like a lot of money. But it looks like a bargain stacked against the estimated cost of $10 million for the direct costs and rehabilitation of the Grose fire. Curiously, one unexpected outcome of the great Grose fire may be that the valley sees more regular, planned fire – something the former wildlife service manager Ian Brown is considering. 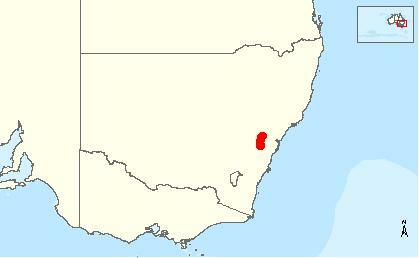 It may be the only hope for Isopogon fletcheri.
. Distribution of Isopogon fletcheri is restricted to a very small area in the Blackheath district of the Blue Mountains. 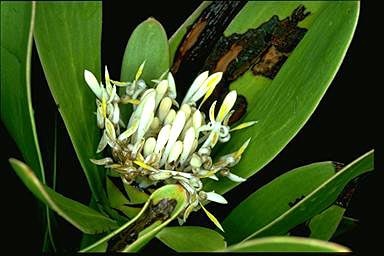 Given restricted distribution, it is susceptible to local extinction due to environmental and demographic uncertainty and in particular pathogens such as Phytophthora cinnamomi. What needs to be done to recover this species? Continued habitat protection. The Blue Gum Forest stands tall, straight and surreal in a fire-ground of still smouldering ash. Three weeks ago it was intensely burnt during bushfires in the Grose Valley. The future of the iconic forest – some trees are thought to be 200 to 300 years old – now hangs in the balance. Last week the massive white-trunked blue gums were dropping their scorched leaves to reveal a stark and unrecognisable forest of tall trunks, bare limbs and fallen logs. The director of the Colong Foundation for Wilderness, Keith Muir, did not speak out during the fires, but now he wants answers. “Could the Blue Gum have been saved using other firefighting strategies that also protected life and property? Was the fire that burnt this very special forest made more intense, unpredictable and extensive by massive backburning operations? Was the Blue Gum sacrificed for the sake of a de facto fuel reduction exercise that didn’t consider heritage values? In the early 1930s the Herald supported a campaign by bushwalkers to save the Blue Gum from grazing and agricultural development. 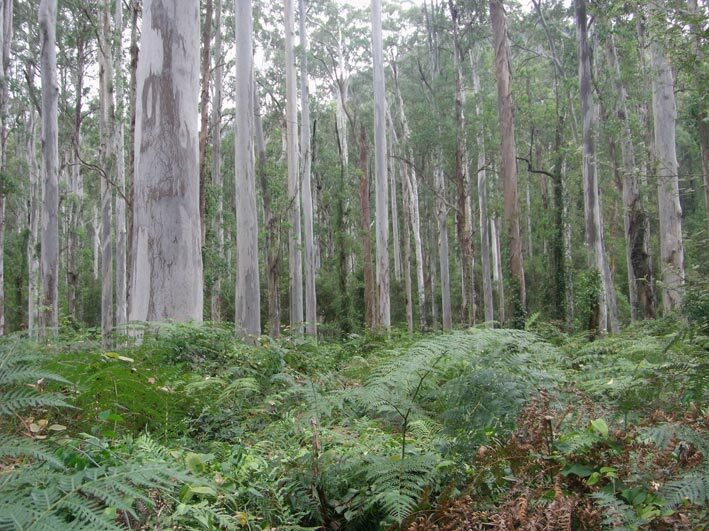 It was the first successful Australian conservation campaign to protect an almost pure stand of tall mountain blue gum ( Eucalyptus deanei) on about 40 hectares of river flats in the rugged Grose Valley of the upper Blue Mountains. The bushwalkers raised £130 to buy the lease covering the forest and create the Blue Gum Forest Reserve. The Herald visited the Blue Gum Forest again last week with a forest ecologist, Wyn Jones, and Ian Brown, former National Parks and Wildlife Service operations manager with overall responsibility for fire management. In 1994 Jones, then an ecologist with the service, helped to describe scientifically the rare and newly discovered Wollemi pine. 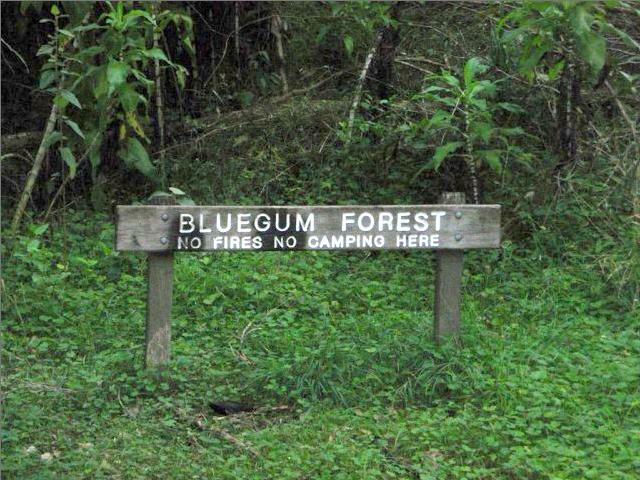 He first saw the Blue Gum Forest more than 40 years ago. He has been involved with it professionally and as a bushwalker ever since. He said the forest would re-shoot and regrow, but it remains to be seen when and how. He predicted its immediate future would be decided over the next six months. That would depend largely on the vagaries of climate. Severe wind storms, a hot dry summer or even persistent rain, fungal growth and insect attack could all compromise the forest’s ability to bounce back quickly. More uncertain and potentially bleak is the long-term prognosis. Jones said changing fire regimes caused by humans could be further complicated by climate change, a recipe for more frequent and hotter fires. The Blue Gum Forest has been burnt four or five times in less than 50 years: by wildfire in 1957, possibly 1968, and in 1982, 1994 and 2006. “Without human interference , this forest may have been burnt once or perhaps twice in 50 years, not five times,” Jones said. Jones is convinced cracks in majestic gums were caused by the fire. If they are deep enough to effectively ringbark the surviving trees, then the demise of the forest promises to be a slow and painful affair. In 1931 the Herald’s conservation reporter, J.G. Lockley, writing under the name Redgum, led a campaign to save the Blue Gum Forest. 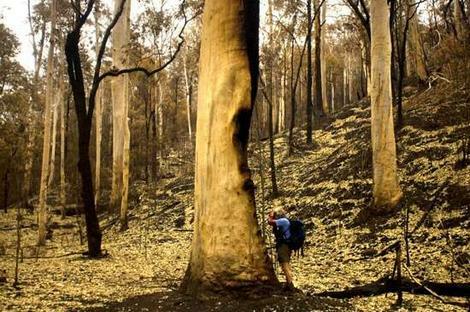 ‘One of our most precious natural heritage assets, the Blue Gum Forest, has been allowed to be scorched by bushfire. This demands an independent enquiry into current fire fighting practices to ensure such a tragedy is not repeated. Not a witch hunt, but what is needed is a constructive revision into improving bushfire fighting methods incorporating current research into the issue. The intensity and frequency of bushfires have become more prevalent due to disturbances by man, including climate change. 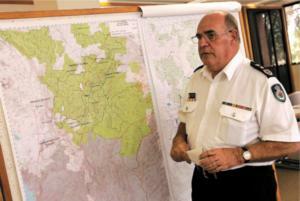 A Grose Valley Fire Forum was held at Mount Tomah on Saturday 17th February 2007, but the public were denied entry. An independent enquiry was never conducted. A public enquiry was never conducted. This entry was posted on Tuesday, December 20th, 2011	and is filed under Blue Mountains (AU), Threats from Bushfire.